Jelly Comb 18 Keys Wireless Numeric Keypad is a perfect companion for your keyboard, laptop or notebook to finish numeric data entry tasks. With this Number Pad, you will find your work efficiency and productivity greatly improved. 1. Plug and Play: Just plug the USB receiver into the USB port, no extra drivers required. 2. Portable & Ergonomic Design, easy to carry wherever you go. Your hand wrist won’t hurt even you use it for a long time. 3. Scissor-switch keys, quiet and responsive. 4. Auto Sleep Mode: The wireless number pad will enter the sleep mode without any use for an hour to save power, you can press any key and wait for 3 seconds to awake the keypad. 5. Long Key Life: More than 10 million strokes times. 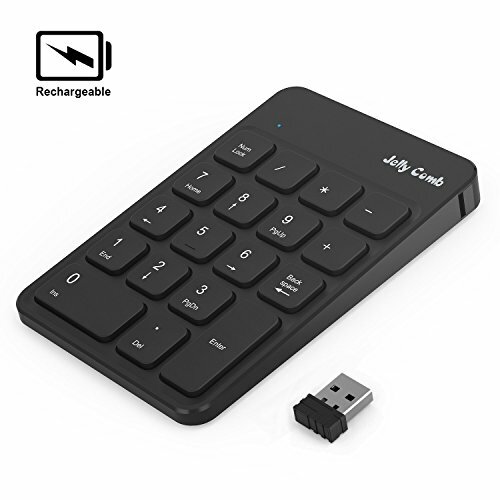 RECHARGEABLE DESIGN: The 2.4GHz wireless numeric keypad uses built-in lithium battery, easily recharged through included USB cable, no need to change the battery. ADVANCED SCISSOR SWITCH KEYPAD: Scissor-switch construction keys, silent to press and rebound quickly, effectively improve your work efficiency and its low tone mitigates the interference for work. RELIABLE 2.4GHz WIRELESS CONNECTION: Using advanced 2.4GHz wireless technology, the wireless number pad will get connected to your computer as soon as you plug the USB receiver into the USB port, plug and play, no additional drivers required. Fast data transmission, no delays or dropouts, working range up to 33ft.